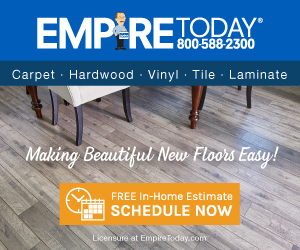 We are dedicated to achieving our vision of becoming America’s first and best choice for installed flooring. This vision could not be possible without customers like you, therefore our goal is to ensure that all customer concerns get addressed. We appreciate you making us aware of your experience, and we’ll be following up with you shortly to start working towards a resolution. It would appear that the main reason Empire Today runs all of those TV and Radio commercials is to attract more customers than they scare away?? In my case I wanted to schedule an estimate. All of the other floor companies would send a person to do the measurements, then a follow up meeting to review the different product options. I work +50 miles from my house. I have a key lock box with an alarm system that can be turned off with my cell phone. Empire would not schedule an appointment unless I was there. So we scheduled on the weekend. The sent numerous emails and text message reminders. The day of the appointment, the sales person was a no show. I called and was told he was sick and could not make it, but no call. The next week same thing, an appointment that they never showed up at or called. When I call, I was told that inspite of all of the emails and text messages, the "sales manager did not assign a representative to my appointment" They lied. This is actually a good sign. I would assume that if I hired them, this apparent corporate culture of wasting the time of potential customer, would only blossom if I was an actual customer?? Good thing I did not need to find out too late in the game. Consider your options......RUN AWAY!!!!! I didn't like: Not accountability broken promises waste my time twice, No corporate oversite, Idiots. Review #1052081 is a subjective opinion of User1052081.